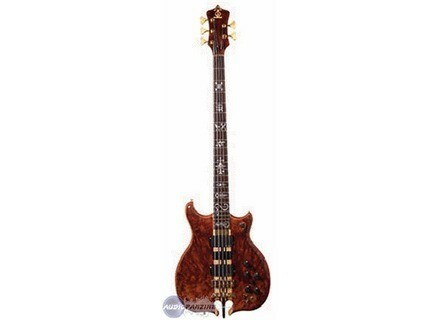 Series II, 4-string bass guitar from Alembic. For me only the short scale of 30.75 "is playable ... the others are too heavy and the handle is endless, but I'm too used to the short sleeves. ... Maddening play with SWR or stereo with a system that prampli, puisance amp, go www.stanleyclarke.com and click on the "gear" you have a current Systm. What changes with the signatures I and II is the price becomes exorbitant, especially in France. Controls the USA. The major diffrence is the Stereo (stereo output jack or Canon depending), and stro said following amplification, a system that micro ... so you spend a budget of 1000 USD for prampli Alembic Stereo and 700 for a good power amp (Crown, Yamaha, SWR) not counting the other effects. I had 3 SERIES I in 1983, I now have the signature deluxe, it's easier and the sound is just as good ... Clarke's playing on tenor Series I, I have the same sound. The Series II is a mess of knobs, we do not know o fingers and ask it to be unsightly. I've never tried, but I never Achteras even if I can afford one day. I put 8 because of the price for his 10 but overrated quality. I buy the series at most. Note from 12.12.2009: I just bought a used 3300USD, a SC 1982, trs good state, it must pass before arriving at Alembic in Europe. Ds that I inform you I try!